Torpeoded and sunk 3 June 1943 in the Indian Ocean at 17° 58' N., 58° 09' E. by the Japanese submarine I-27. Propulsion: One 3,000ihp steam engine, one shaft. Donation of Dr. Mark Kulikowski, 2005. 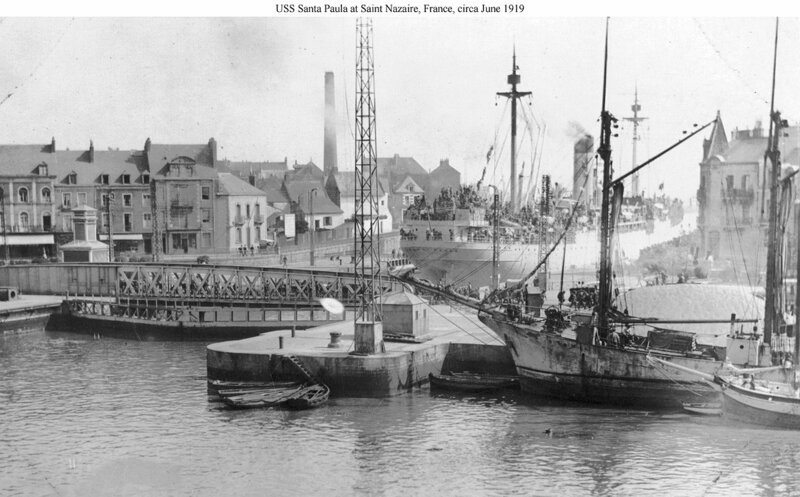 209k Photographed circa June 1919 in the lock of the New Entrance at Saint Nazaire, France, with the outer lock gates and the Rolling Bridge in the foreground. A crew member, Francis Locke, wrote "We docked at high tide which was about 4 A.M. Troops started coming aboard immediately. We could not sail until high tide which was 5 P.M."
91k Arrives in New York Harbor after a voyage from France, circa April-August 1919. Her decks and rigging are crowded with troops. Photograph received from the Caraway Company, Rutterford, New Jersey, 10 August 1936. Dictionary of American Naval Fighting Ships History: Santa Paula (ID-1590), a single-screw, steel freighter built during 1917 by William Cramp & Sons Co., Philadelphia, Pa., was acquired on 14 August 1918 by the United States Navy from W. R. Grace Steamship Co., of New York City and commissioned on 15 August 1918, Lt. Comdr. David J. Wade, USNRF, in command. 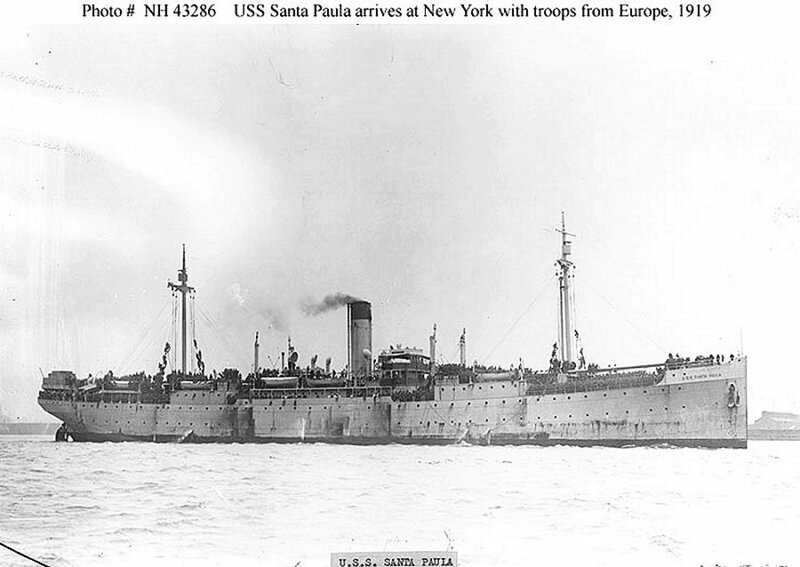 Santa Paula was assigned to the Naval Overseas Transportation Service (NOTS) to carry cargo for United States forces fighting in France. She only completed one round-trip voyage, from New York to Marseilles and back, with 8,340 tons of general cargo, before the war's end. 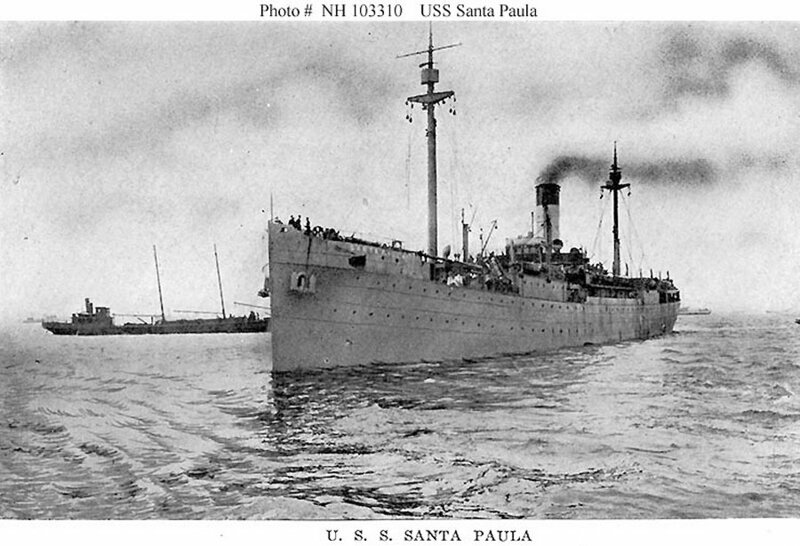 Santa Paula made a second voyage to Marseilles between 21 November and 14 January 1919 with supplies to sustain United States forces still in France before she was transferred to the Cruiser and Transport Force on 17 January. 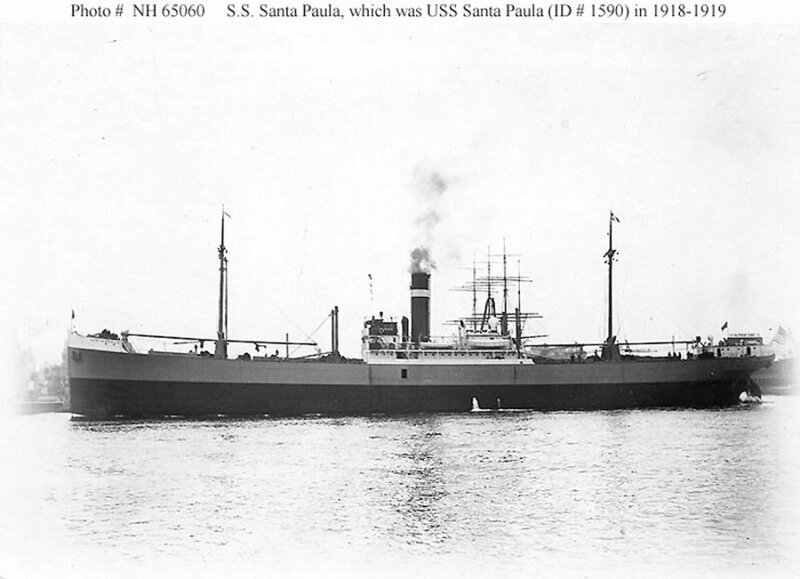 Santa Paula then returned American troops home from France during four additional round-trip voyages from New York to Brest Bordeaux, and St. Nazaire between 22 March and 1 August. When the last of these voyages ended at New York, the ship was turned over to the custody of the Commandant, 3d Naval District and was decommissioned on 21 August 1919 and simultaneously returned to her owner. Renamed Montanan during 1925, the ship remained under United States registry until she was sunk by submarine torpedoes, in the Indian Ocean, on 3 June 1943.